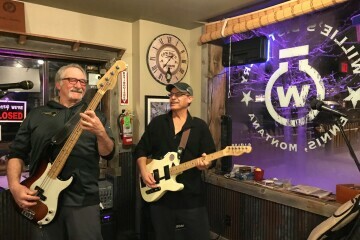 Originally from McAllister, Montana, the Fan Mountain Frog Dogs are a powerful duo consisting of Terry Koral on rhythm/lead guitar and Chris Casey on bass and harmonica. Awesome lead vocals paired with a rocking guitar fuel the groovy, jamming music of FMFD. Consisting of upbeat originals, quirky covers, familiar rock jams, and fun toe tappers, the Frog Dogs provide something that everyone is sure to love. Settle in for a great show from these seasoned multi-instrumentalists!